The coffee grinder review here is about the Proctor Silex® blade coffee grinder model # E160B (or 45802BY). It's a little, small, cost-effective and very basic coffee beans grinder. The advantages of this coffee grinder is that it's little and compact, small footprint, has a retractable cord, and it is cheep. For a video review comparing this grinder to the Krups® 203-425 blade grinder machine click here. It does the job for starters. As a blade grinders, it chops off the beans, instead of really grinding, like burr grinders do. The difference between a blade and burr grinder (especially a conical burr) is notable, both in quality and taste. For a start, however, the blade grinder will suffice when brewing with an auto-drip (for espresso, you'll surely need a better grinder). 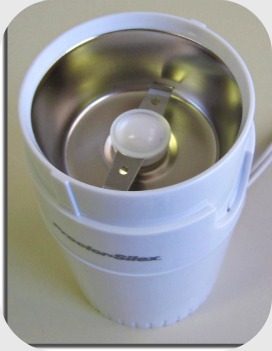 Watch this video review of the Proctor Silex coffee grinder. The main advantage of this blade grinder is that it is cheap; I bought mine for $13. As of durability, it can last quite a while provided that you handle it with care. After quite a while of usage, the cord of my grinder got a little bit torn. It is also hard to clean beneath the grind button that is glued to the grinder, and if you try too hard, the button can detach or break. It has a retractable cord that comes out when you turn the grinder, and it coils back in when turned the other way. This is really cool and appreciable. I don't enjoy this convenience with my Krups® 203 blade coffee grinder (which is superior altogether, though). It works simple. Remove the cover, load your beans, replace the cover, and press the "button," the plastic piece that locks the cover. Grind for about 30-40 seconds, or a little bit more (as I do) for a bit finer ground. You can't compare a little cheap grinder to the much better burr grinders, though. It has not grind-level settings, and the grind is not uniform, but for beginners, or if you ain't much particular, it will do good for basic drip-brewing. It grinds rather coarse. The grinder is low-capacity, but it does take in enough beans for brewing 7-8 cups, or even more, depending on the strength of your coffee. Unlike fully automatic coffee grinders, you have to keep pressing the button while grinding; once released, the grind stops. With this grinder, it's even harder, because the button is on the side of the grinder, meaning you have to press your thumb against it, unlike a grinder like the Krups 203 that has the button on top of it, which is much easier to press and hold down. Of course, if you need a better grinder, really grinding the beans instead of shopping them off, featuring various controls and grind levels, and producing a uniform grind, you'll need a more advanced grinder, ideally a conical burr coffee grinder. All in all, it's a good little, cheap grinder, certainly worth its low price. Compared to other low-end blade coffee grinders, the Proctor Silex E160B grinder has some advantages as well as downsides. On the pro-side, it is cheap and has a small footprint, and It features a retractable cord, allowing to wind it in and out. On the flip-side, it grinds coarse (actually desirable for a French Press), and the button that is on the side of the machine is relatively hard to press and hold on. Shake slightly and turn grinder to the sides, to ensure all of the coffee is ground well. When grinding is done, before removing cover, turn the CoffeeGrinder upside down and tap gently a few times to release all the grounds and prevent them from sticking to the grinder. Unplug and turn the grinder to roll back the cord into storage. Go to the coffee grinder review page for more reviews and information of coffee beans grinders. Do you have a great coffee story about this? Share it with the rest of us! Don't Miss a Single Issue! I promise to use it only to send you Fresh-From-the-Coffee-Press.